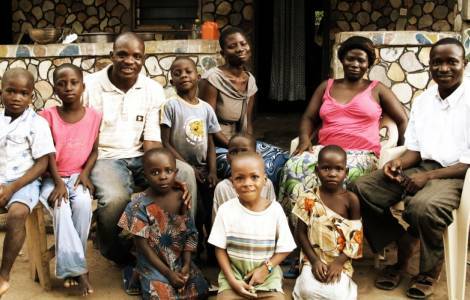 Kinshasa (Agenzia Fides) - Promoting Christian marriage and making families aware of their responsibility as Christians. These are the objectives of the diocesan week of the family, promoted by the Archdiocese of Kinshasa. Organized by the Commission for the pastoral care of marriage and family (CPMF), the initiative takes place from 18 to 24 February. This year the week of prayer has the theme "He took away our infirmities and bore our diseases" (Matthew 8, 17). According to Father Floribert Mafuta, diocesan chaplain of the CPMF, this theme takes into account the social reality of the Democratic Republic of Congo whose youth is condemned to high unemployment and ignorance due to the lack of adequate education. This exposes young people to alcoholism, to all kinds of dissoluteness and free union. This is why the theme of the week is combined with that of the pastoral year of the Archdiocese, that is to say "Youth, discover your identity". "The activities of this diocesan family week aim to show that Christ frees us from all evils. The goal is to remind parents that for our salvation we have an interest in cultivating the meaning of sacrifice. The example of Christ will thus inspire our families and will give us a firm faith by helping us to discern our vocation", explains the chaplain.